Alamo Lake is arguably one of the best largemouth bass and crappie fisheries in Arizona! This 3,500 acre lake was created in 1968 following the construction of an earthen dam on the Bill Williams River. This lake is subject to abrupt water level fluctuations so we suggest checking current lake levels before your visit. Cabins and campgrounds make it possible for anglers to enjoy this remote lake for several consecutive days while taking advantage of hot fishing conditions. Rig the kids up with a bobber and a worm and they'll stay busy with the sunfish and bluegill while parents cast lures for largemouth bass. 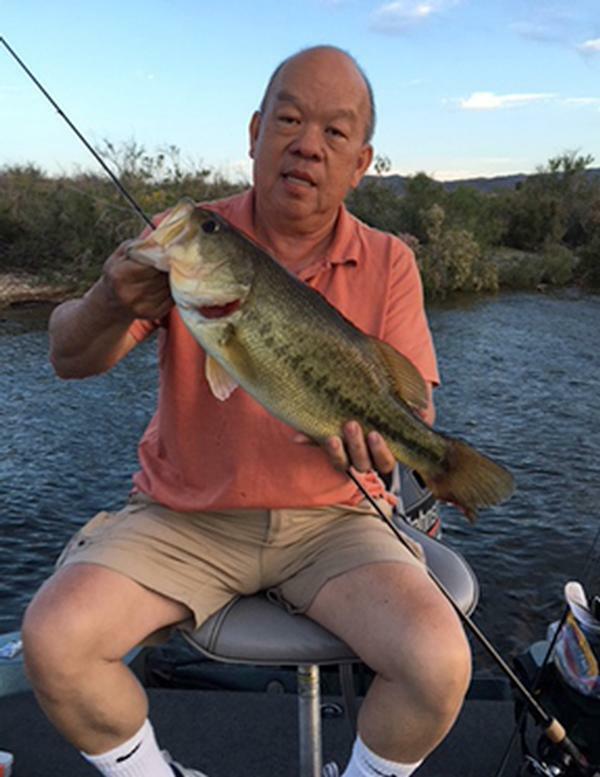 This fishery supports a thriving largemouth bass population, and sits within an absolutely gorgeous Arizona Sonoran Desert setting. Bass fishing tournaments occur here frequently because the bass are typically willing to engage with anglers which creates an exciting situation for sure! Good fishing opportunities can be found year-round, although the springtime spawn is a widespread favorite for anglers. In general, bass are less active during the winter months than other times of year and require a certain amount of tact while enticing them to bite. Typically, soft plastic baits and jigs fished slowly in deep water are your best bet for wintertime bass. As winter gives way to spring, and lake temperatures begin to rise, the bass will become more active as they search out their shallow water spawning areas. Buzzbaits, spinnerbaits, and crankbaits are popular during the spring and early summer while retrieved quickly to trigger a response from already active fish. Sight fishing becomes extremely popular this time of year as well. Get yourself a good pair of polarized sunglasses to cut the glare from the water during your search for fish on their beds. Sneak up carefully whether in a boat, or from shore, and toss a lure past, or into the bed of the fish. The natural reaction of bass on their beds is to protect their precious cargo of eggs or fry. The reaction to strike a lure is simply their instinct to ensure the propagation of the species. It’s no secret that bass are easier to catch this time of year as anglers exploit the natural responses of their instincts. It’s a lot of fun to catch a bunch of bass during the annual spawn. The weather is great this time of year, the wildflowers are blooming, and the bass seem to hit almost everything you throw their way. Please keep in mind, that in order for a fishery, and subsequently the bass population to grow, fish recruitment must be at levels that allow it to do so. We ask that anglers practice catch and release during the spawn to ensure the bass are able to complete their goals of raising a bunch of little bass for your to catch a few years from now. This self-regulation of take will ensure that you and your family will be able to have successful fishing trips to Alamo Lake for years to come. Just as this beautiful desert lake supplies great fishing for largemouth bass, the crappie angler can catch memories at Alamo as well! The lake is home to voracious schools of stout black crappie that fight hard, and taste great! Because crappie are schooling fish, and can often be caught on bait (as opposed to lures) they are considered a great fish to get youngsters interested in angling. A fishfinder helps to locate schools suspended in the lake. After confirming you are over a school, drop minnows, or a commercially prepared crappie doughtype bait to that depth until you find what the fish prefer at that time and place. The depth in which the fish are frequenting will dictate if a bobber is used. Adults (and experienced kids) can use a variety of crappie tubes , spoons, and jigs while enticing Alamo Lake crappie to bite. Light line and lightweight spinning tackle will ensure the crappies do not see your bait or lure offering while remaining sensitive enough to feel light strikes and nibbles. Visit our Fishing in Arizona page to learn more about fishing opportunities throughout the state park system. A valid Arizona fishing license is required for anglers 10 years and older. Arizona fishing licenses are available on the Arizona Game and Fish website, and a variety of authorized license dealers throughout the state. Before your trip, take a look at the current AZGFD fishing report.